Good Morning! It's time for our lovely Ms. January's challenge. Jenn Borjeson is Bombshell's Ms. January! Her challenge theme is Heartbreaker. She wants you to get in the mood for Valentine's Day by thinking about hearts, love, music, song lyrics, poetry, and literal broken hearts. Now, keep in mind, Valentine's is not one of my favorite holidays ever, but I do like how this turned out - with a little help from my friends (thank you Pam, Ann and Jaci, such fun gals!) who happily gave suggestions on this one. The stamp is Scared Heart ( love it! ), colored with you guessed it - Copics! 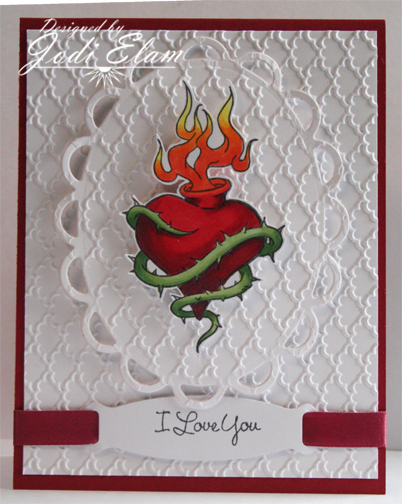 I used and embossing folder for the background of the card and the heart (Pam, I couldn't remember the name of the folder help!) I colored white satin ribbon with my Copics to match the rest of the card. Join us won't you? Create a card in the tune of Valentine and add your link at the bottom the the Bombshell's Blog post for your chance to win a stamp set! Jodi - I always love to look at your posts, but I have a question about Copics. I have used them on ribbon, but do they work on fabric as permanent color? This is for a wall hanging that won't get washed often, just occasionally. I hate to start playing around with the fabric if the process won't work at all! Thanks for your help. Yes, you can use them on fabrics, however Copic doesn't guarantee they won't wash out. My theory is that they're alchohol based markers and are permanent as long as they don't come in contact with anything alchohol based. I know lots of folks that have used them on different fabrics with success. You could always test it out on something small - and if it's something that won't be washed very often you'd probably be okay. Hope that helps!